He comes to kill, steal and destroy…and he is green ~ for at least part of his life cycle. The hornworm. I have told you about him. He can chew through a whole tomato plant in 24 hours flat, engorged and gross, 3-4″ of huffing and puffing, swollen and green slimy-ness from the leaves he has munched through, poop piles littering his path below him as he climbs ever upward, destroying the tomato. No leaves on the plant = no tomatoes. We HATE the tomato hornworm. 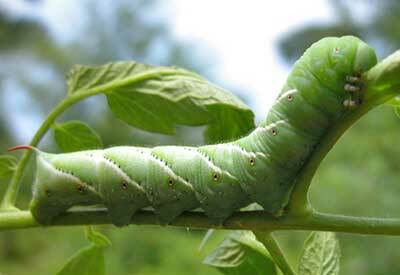 But a lot of gullible people think the moth that deposits the larvae into garden soil around your plants – which becomes the hornworm caterpillar is so cute. But – people think it is a hummingbird. Because it is large, almost the size of a hummingbird. It has interesting coloration and design, not at all bland-blah like the gray-powdery june moth that sweeps through here from Nebraska in sometimes plague-like proportions. This moth flies sort of upright like the bird and has this feathery looking tuft of something or another and is really quite huge and monstrous. This moth is the enemy of the tomato and other garden goodies. the ENEMY! In my efforts to truly be organic and not use bug killers in my garden, this year I have taken to carrying a fly-swatter with me to put the smack-down on moths which seek to lay eggs in my sweat-composted soil. ‘Tis better, I do think, to save my crops and eat the food I have determined to grow than to let the bugs have it and a little swat and down is better than spraying chemicals or poison sprinkling granules. I admit I may look a little crazy out there, swinging a plastic aparatus at a flighty moth – but I give it a go and some days have success. But dang the “hummingbird moths.” A kick scan through Facebook and Instagram and 82% of everyone I know is posting a picture of it and celebrating it, thinking it is a hummingbird! People think they are cute! The other day, while I was armed and ready for battle as 4 of them were sucking juice from my Hibiscus, I caught some eyes peering out the kitchen window from a house across the way. I was swinging away. I sheepishly smiled and waved wondering if she thought I was totally crazy? A little later Dave happened upon a conversation about all the beautiful little “hummingbirds” in the neighborhood, resistant to the suggestion that they were moths. When he told me, we realized – someone in my neighborhood now thinks I beat the crap out of hummingbirds with a fly-swatter. The word is spreading. 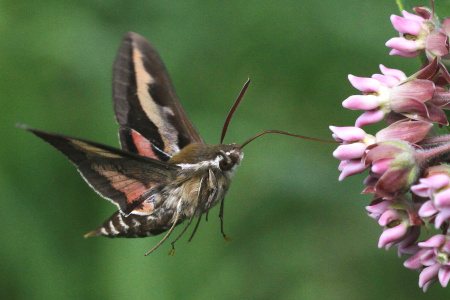 sphinx moth = hawk moth = hummingbird moth = heavy-bodied, strong flying insects = from full-grown hornworm larvae = gross = evil = the devil in my garden = yes I kill them if I can. I hear they taste like tomatoes, so to me they are almost as appetizing.